We frequently hear from first time customers who are so confused by the many names used to describe “industrial manipulators” that they aren’t sure what product to be looking for when they need to add or upgrade equipment in their work environments. We can’t blame them for their confusion: pneumatic manipulator, lift assist, ergonomic manipulator, material handling equipment, jib cranes, vacuum lifts and hydraulic arms are just a few of the many ways people have come to describe machines that execute similar actions. If you’re on the hunt for one of these products, it’s important to have a clear understanding of how each machine works and how well it will integrate into your current workflows. That’s why we’re laying the groundwork to help you understand what industrial manipulators are and how they work. What does an industrial manipulator do? First things first: an industrial manipulator is a machine with a rigid steel manipulator arm that allow complex pneumatic tilts and rotations, even when the product being moved is handled outside it’s center of mass. A human operator controls the machine, allowing for easy and precise movement of the manipulator to lift, lower and otherwise transport a product. The ability for the manipulator to move products outside of its center of mass becomes increasingly important as you start working with heavier loads or products that are awkwardly shaped, as other types of machines (including industrial balancers with cables) don’t play as nicely with products that aren’t relatively light or standard in shape. At Dalmec, we make manipulators and cable balancers. How does an industrial manipulator differ from a cable balancer? 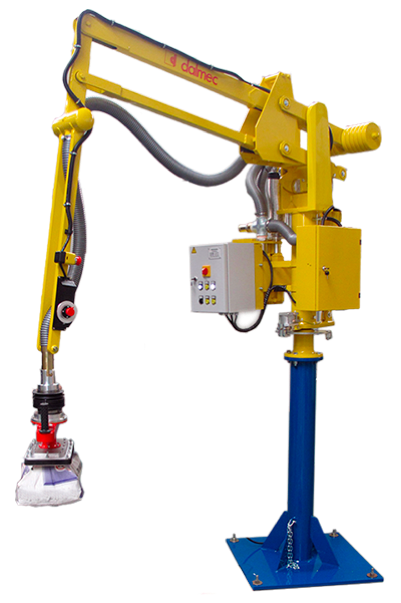 As touched on above, cable balancers, also called rigid arm manipulators, are best for moving lighter objects that are in standard shapes. Instead of relying solely on a rigid arm like machines without cables do, cable balancers use steel or nylon cables to move products up or down. On most balancers built by Dalmec, cables wrap around pulleys on pneumatic cylinders and as those cylinders open or close, the cables move up or down. Some of these cable systems may be on horizontal arms to allow movement around a center point, but all the lifting is done through the cables. Some small manipulation of product can happen through the tooling if the manipulation has a small center of mass. 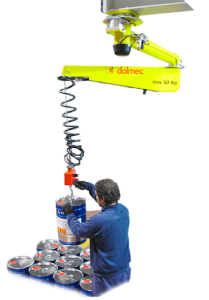 Who uses manipulators and cable balancers? Which type of manipulator should you use in your work environment? Lighter weight products (usually those less than 200 lbs) and standard shapes that only need to be moved up and down are good candidates for an arm with cables. Heavier products (up to 2,000 lbs), products with odd shapes and products that need to be moved and repositioned both horizontally and vertically are best suited for industrial manipulators.